After a botched election, and then an awkward response to the Grenfell Tower fire that left the Queen to intercede to calm the nation, even the loyalist press has turned against her — with the conservative Sunday Telegraph and Daily Mail ganging up on her. But there are good reasons, five to be precise, why May isn’t going anywhere anytime soon — and one big reason she might be forced out of the driver’s seat in the U.K. If May leaves No 10 Downing Street of her own accord or is dragged out by her rivals, the result would be the same: she was forced to go because the public rejected her leadership. What then gives her successor the right to assume he or she can govern without the endorsement of the public? “Unless she says it’s for medical reasons then we’ll have to go to the country sooner or later and that’s a real risk,” one government minister told POLITICO. One option being discussed by Conservative MPs is for a “caretaker” prime minister to come in and oversee Brexit before calling an election in 2019. It would doubtless mean a softer, more consensual Brexit with big questions over the single market and customs union potentially left unanswered. One name being discussed is Philip Hammond, the Chancellor. If there was someone obvious who could do what May has failed to by uniting the country, then she might have gone already. But there isn’t. 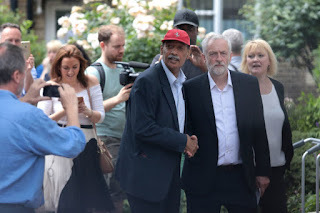 Jeremy Corbyn’s supporters like to claim he is now the prime minister in waiting — but he won fewer votes and fewer seats than the Tories, he has a fuzzy vision of Brexit and he ran a campaign about austerity, not leaving the EU. Perhaps more importantly, on the Tory side there are no clear contenders either. David Davis and Boris Johnson are the favorites. Both are more confident, charismatic figures than May. But in the wake of the Grefnell Tower fire, Johnson’s bumbling persona is judged unsuited to the times by many of his colleagues. Davis tried for the leadership before, losing to David Cameron in 2005. Many Tories do not believe he’s the answer to their problems. Amber Rudd, the home secretary, may have been an option before the election but she sneaked back into parliament after two recounts and could well lose her seat at the next election. Tory grandee Kenneth Clarke is fond of reminding people that the winner of Tory leadership contests often emerges from left-field — from Thatcher to Major to Cameron. So don’t rule out a centrist candidate who embraces Brexit — the new First Secretary Damian Green perhaps, or the George Osborne acolyte Sajid Javid. Watch out for any young pretender who reaches out to the Conservative’s popular leader in Scotland, Ruth Davidson — a potential kingmaker in any future election. The last thing the Conservative Party wants is another general election. The emotional national mood is too unpredictable to risk it. 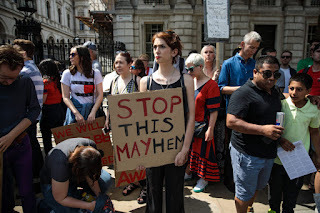 Some ministers who spoke to POLITICO fear the “intensity and ferocity” of the public response to Grenfell Tower, and how quickly it has turned into a symbol of Tory misrule, may yet be too great for the prime minister to withstand. However, even if she is forced out, Tories remain determined to kick the can of another general election down the road for as long as they can. It’s not just the Conservative Party that doesn’t want a general election. The Democratic Unionist Party, May’s prospective parliamentary partners, will never again be in such a sweet spot. A party with 10 MPs, representing the unionist half of the six counties of Northern Ireland, now holds the balance of power in the world’s sixth largest economy. They’ll want to eek this out for as long as possible. In Scotland, the SNP are desperate to avoid another poll. They fear a further erosion of support should voters be given another chance to debate a second independence referendum, which has become a millstone around the party’s neck. There are many non-Corbynite Labour MPs who told the electorate he could never be prime minister and who now fear having to go back to those same voters to tell them that he can. Many in the Labour Party still do not believe a Corbyn premiership is in the national interest. If that’s what Labour MPs feel, imagine the reaction from Conservative MPs. There is a genuine concern in the party that anything that increases the chances of a Labour general election win has to be avoided at all costs — even if that means sticking with a party leader whose authority is shot. The alternative view is that the public will “come to its senses” when it comes to Corbyn, in the words of one Tory minister, who spoke on condition of anonymity. But for most MPs and ministers it is too big a risk. After May, the next long-term Tory leader is unlikely to be forced on the party in another coronation. That view has been publicly put forward by the former education secretary and leadership hopeful Nicky Morgan, but is widely held. Unless there is a “caretaker” leader for 18 months, the new Tory leader will therefore require a vote and that means a campaign. And campaigns take time, which is the one thing Britain doesn’t have as Brexit negotiations start in Brussels on Monday. What’s more, any campaign will inevitably boil down to Brexit — hard or soft. So any leadership contest forced on the country by May’s resignation (or a coup) will mean Britain’s Brexit clock ticking away while the governing party decides its own future. The public anger at such obvious national mismanagement might well be enough to force them out of power. So for worse and for better, Theresa May is the prime minister seen as the one who should settle the divorce with Europe. Reason and logic are all very well, but sometimes the pressure for change is too great to withstand. At the moment, May can do no right. The personality traits which were qualities two months ago when she called the election — steadfast, unshowy leadership — are serious deficiencies. She is now unresponsive and robotic — a leader lacking compassion. Theo Bertram, a former adviser to Gordon Brown, summed up May’s problem in the Sunday Times. “No matter what May does, she has an unshakeable problem with people,” he said. This is unsustainable. If May does not have the confidence of the people, then she has to go. Her party will ensure that happens, because they will have no choice — any option which keeps her in power would be worse and all the problems associated with removing her will have to be managed, even if that means another election which produces another stalemate.